Emma Crosby is currently on our screens presenting 5 News every weekday. Her passion for journalism has taken her from CNBC to Sky News and onto GMTV before taking over 5 News' 6.30pm show. 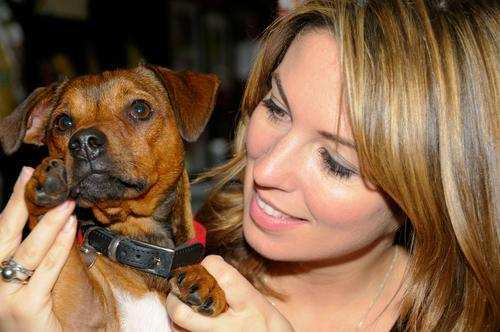 K9 Magazine caught up with one of the UK's most popular news presenters to find out about breaking stories and two of the big loves of her life, her dogs Teddy and Pickle. I have two Jack Russell Terriers, Teddy and Pickle. I got Teddy when he was five months old and he's been with me just over a year so he's 1 ½ years old now. In fact I had him presenting with me in a field on location last year at the Royal Wedding. I was presenting from Bucklebury, the village which Kate grew up in and Teddy was with me. I've always loved dogs and wanted a Jack Russell Terrier. For years I thought my job and lifestyle wasn't right for a dog but a couple of years ago I thought actually you can make it work if you have the right surroundings and support network, such as Bishop's Bark in London, where Teddy and Pickle go to doggy day care. So once I started thinking like that I did a lot of research to find the right breeder. I knew I wanted a tan Jack Russell Terrier after meeting one that was just gorgeous and they're not that common so it took me a while, but eventually I found a breeder in Suffolk named Vivienne and when I got in touch they had a five month old tan Jack Russell who wasn't getting on with his dad so they were looking for a new home for him. I went to meet him and I wasn't sure about having an older dog as my first dog, I thought I might miss out on bonding with him as he grew up from being a puppy and would miss those big puppy landmarks, but when we met him he was such a lovely dog. He was very quiet, well behaved and loving and I fell in love with him. It was such a busy week when he came home though, I was at 5 News at the time and luckily I had really dog friendly producers around and they suggested I bring him into the studio with me in his first week. He was quite scared and not quite sure about his surroundings, looking back it must have been quite strange for him. At the time 5 News was in the same building as Sky News and I remember Teddy running onto the set while it was live. And then of course we were filming on location for the Royal Wedding which again brought new experiences. We smuggled him into a petting farm and there were lots of ducks and geese wandering around and he wasn't interested at all. Bless him, his first week was sort of a baptism of fire! He's such a fab little dog. We're super, super close, he's a very loyal dog. Pickle is five months old so still growing. I always knew I wanted to get a second dog, for Teddy as much as anything. Before Christmas I received an email from Teddy's breeder about a puppy they had which had come back to them, they sent me a photograph and she was very cute but I wasn't sure so I went on holiday and thought about it. I then found out they were having a litter of puppies and decided to wait and they had two tan puppies in the litter so we chose Pickle! We always had cats growing up, in fact our last family cat lived until he was 18 years old. He was an adorable cat and I have wonderful memories. I remember when I was growing up my mum and dad had an extension built on the house and the builder who came and was working it had the most gorgeous Collie dog. He became a real pal to me. I'd jump out of bed in the morning and spent the mornings playing with him and getting up to all sorts of mischief feeding him the bread meant for the birds when I wasn't at school. I really loved him and he loved being with me. I get the very same feeling with Teddy because he's so loyal and protective. This year is a big year for all things British with the build up to both the London 2012 Olympics and the Queen's diamond jubilee. What are you most looking forward to about each event with your Five News journalist hat on? For me it's the big stories that I'm here for. I love doing my job and unfolding the details of a story whether commenting or filming livefrom the scene and I think this is what I'm here for. I feel very lucky to be able to do something I love and still get goose bumps on the back of my neck. There's maybe 4-5 big stories a year if that and it's a real privilege to do what I do and unfold the details of the story. The Royal Wedding was one, the Japanese Tsunami was another. I think there's certain stories people tune in to watch because they affect their lives and so I feel really very lucky to be able to do what I do. I think the Diamond Jubilee is such a unique event, something to make you feel very proud and British and the Olympics is the same.There's a real vibe in the air. (Laughs) Although I'm not looking particularly forward to the traffic around London. I think it'll be a very exciting Summer! And finally, this is always a tough question and often requires a fair degree of thinking time but….If Teddy and Pickle had the ability to speak and answer one question and one question only, what would you ask them and what do you think that they would say? Oh, well I think I'd have to ask them 'do you know you're loved?'. I'm always asking my friends and family if they think they know how much I love them, and I think they'd say 'yes, absolutely'.